Workflow templates stages include Forms/tasks, Showcases, Approvals, Contracts/Policies as well as other custom stage types. Each stage type has different configuration tabs due to the varied uses. Stage data can be stored and recalled from the staff member’s profile in objects or option sets for access and modifying later. Drag and drop a stage into position on the workflow template canvas, and click to configure. Milestones can be placed anywhere on a canvas and don’t require configuration, they only need to be named. Consistent naming of milestones across templates will help when comparing progress of workflows for reporting. A Showcase is a way to present data to a participant. When notified about a showcase the participant clicks on a link to view formatted general information, existing object data, images, videos, maps, and links to download files (which can be added during configuration, or linked to an existing file object). Colour coded grey, can be assigned to company or employee participants. Notifications allow for configuration of a formatted message to be sent via email and/or SMS. They can be sent to a candidate or staff member, or the workflow manager (or another manager group) to update them on the workflow progress or advise the next steps in the workflow. The most complex and flexible stage. A form/task can do all a showcase can, such as displaying formatted data, images, videos, maps and downloadable files, but where the main purpose of a showcase is to present data, a form/task can also collect data, including request uploading of files. Data can be collected via short or long input fields, a date picker, or selected from an option set accessed by a dropdown and multiple choice list. A required timeframe for completion in days can be set. If the form is not completed within that time frame the workflow is flagged as at risk of missing its due date in the workflow list. An Approval presents data in the same way a showcase does, and requests the recipient click an approve button. Required sign-offs can be assigned to internal managers or an external approver. Timeframe for completion is set and if not approved by within allocated number of days the workflow is flagged as at risk of missing its due date in the workflow list. Uses a contract/policy templates to get a signed acceptance. Unlike data objects and option sets which can be added while building a workflow template, contract or policy document templates need to be configured before you can add them. These templates are managed in Core HR >Account data > Contract & policy templates. If a contract/policy is not signed within that timeframe the workflow is flagged as at risk of missing its due date in the workflow list. Black, can only be assigned to a candidate or employee. 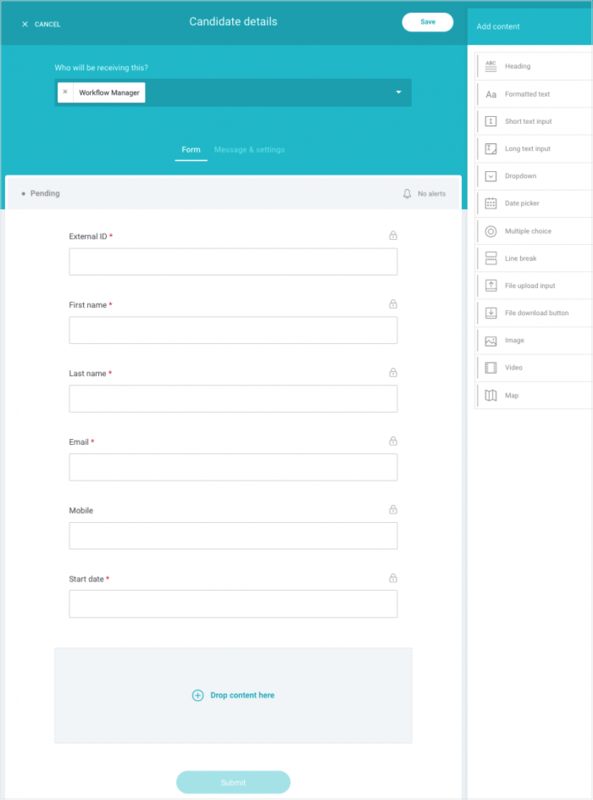 A preloaded configuration for onboarding workflow templates. Placement is after the ‘Offer created’ milestone by default, but can be moved, providing flexibility to support hiring process requirements. No configuration required. Company coloured – this configuration item can only be placed on the company side of the canvas, and only appears in onboarding workflow templates. 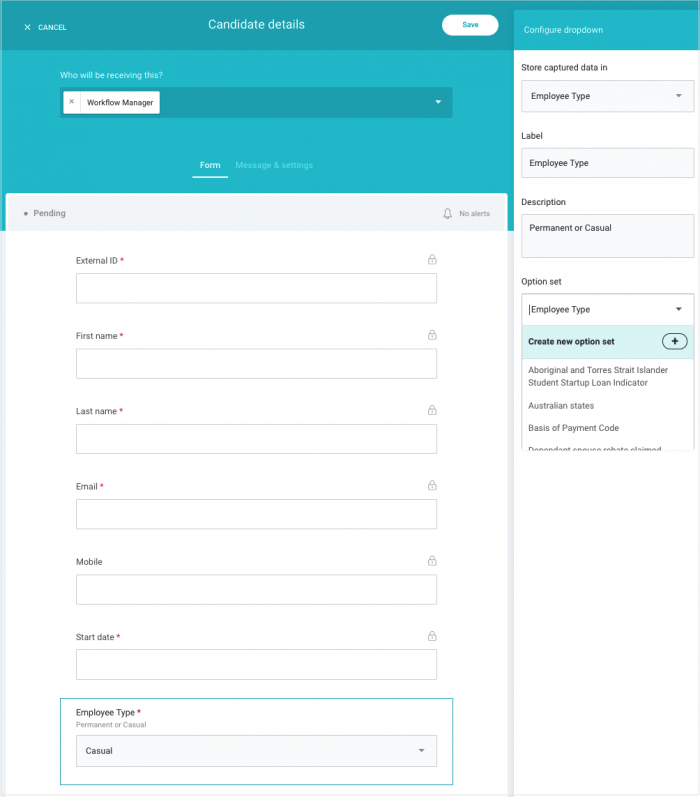 The preloaded onboarding workflow stage ‘Candidate details’ form is shown below. These are all short text input fields, except for the date field which will present the dropdown date picker for the form participant. The required fields are indicated by the red asterisks. These fields are all key to kicking off a workflow for onboarding, and are locked to this form as indicated by the lock icon to the right of the field name. Additional data can be requested or provided, by dragging from the list on the right and placing in the ‘Drop content here’ section. A new content field has been added to the form using a dropdown list, shown below. Existing object and option sets can be used, or new ones created as required if they are not already setup. All other stage content is similarly customisable, and is based on objects and option sets being used to manage and store data. 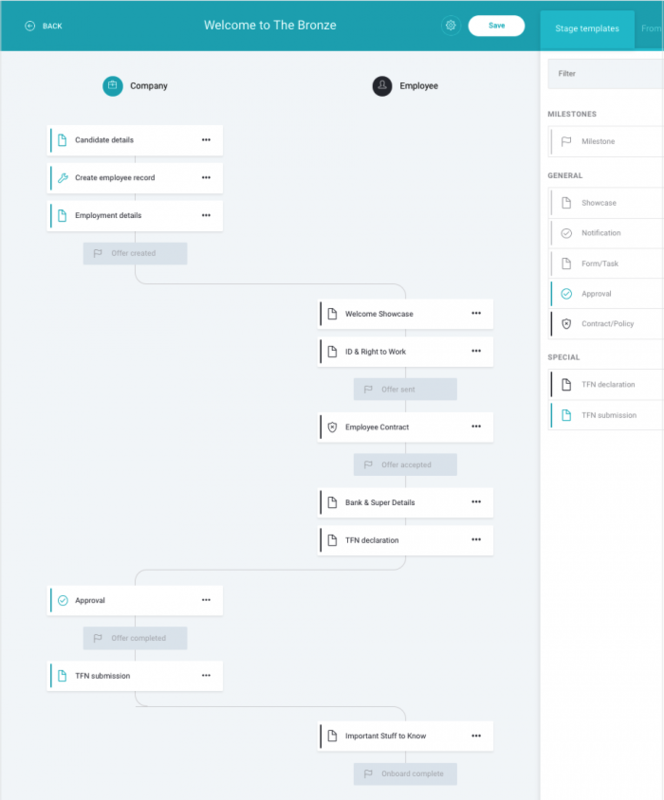 Onboarding workflow templates have fixed milestones, with stages placed around them to facilitate the sharing and capturing of data involved in the hiring process. The template below shows the various stages that participants will action. The workflow manager will be notified when the Create employee record configuration stage is reached and the employee record is created. It appears in the workflow but no action is required. Other workflow templates use the same stages to gather or provide data and other information, as well as optional milestones to track progress. Other workflow templates can be fully customised to meet a variety of needs, such as prescribing an offboarding process, contract renewal or updated company policy sign-offs or for distributing training materials.